With no competitions in the next six weeks or so, the squad has been sent on vacation. Players report back on 4 January. No matches means fewer post here at Anything Palmeiras, although I’d recommend you not to stay away too much; you’ll learn there’s plenty of action to write home about even during holidays. The Brazilian Sub-20 championship is under way. The format of the competition is four groups with five teams in each, where the top two in each group advance to the quarter-finals. 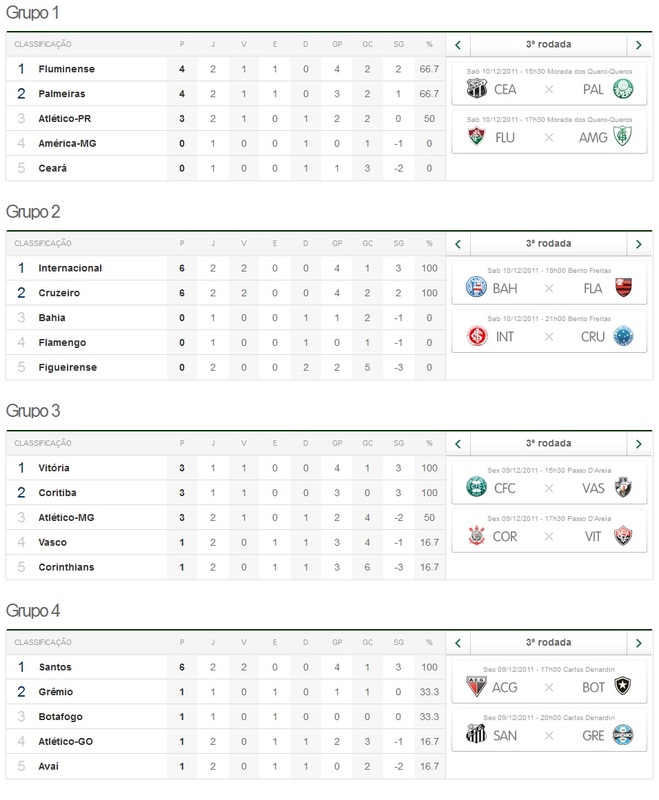 Palmeiras play in group 1 and currently ties for first position with Fluminense. The Verdão beat Atlético Paranaense 1-2 in the opening game and yesterday drew 1-1 with Fluminense. Check out the full tables to your right (source: globo.com). Yesterday’s game against Fluminense ended badly for midfielder/striker Patrick Viera, who was integrated into the A-team by Scolari in the second semester. The 19-year-old suffered a serious injury to his left shoulder and is undergoing surgery as these lines are being written. Viera will need 3-4 months before fully recovered. Bruno Dybal, recent sub-17 Paulista champion, replaces Viera on the sub-20 team. Good luck to both of them. Another player going under the knife is defender Thiago Heleno. Thiago has for some time complained about pains in the frontal part of his feet. Turns out he has metatarsalgia, also known as stone bruise, which is a type of inflammation that occurs in a part of the foot known as the metatarsal (ball of foot), normally where the three middle toes meet the ball of the foot. It is a product of high impact activities or, sometimes, caused by badly-fitting footwear. The surgery is a simple procedure but recovery painstakingly slow: Thiago should be fit for play only in April – after the end of the São Paulo State Championship. The injuries only further highlight the need for reinforcements at Palmeiras. The transfer market is bubbling with speculations and names are dropped 24/7. Palmeiras have yet to confirm any signings – which is a bit worrying – but have advanced in the negotiations with several players. Only one will be mentioned at this point, as both Palmeiras and the player seem to consider the transfer a done deal: Juninho, the 21-year-old left-winger who has played for Figueirense since 2009. Juninho was elected the best in his position in the 2011 edition of the Brazilian Championship, receiving the “Silver Ball Trophy” (picture). We’ll provide you with more info on this interesting player as soon as the signing has been confirmed. Not only the transfer market generates speculations, but also sponsorship deals. It’s not yet official but well known that Fiat is withdrawing as main sponsor of Palmeiras; the toughening financial climate is allegedly partially to blame. Negotiations could be under way with another car manufacture and both Hyundai and Chinese Jac Motors have been mentioned. It would be good to have this sorted out as soon as possible so that Palmeiras could start the Paulista championship financially strong. That’s it for now. Next post will cover the visit of the female Italian national football squad, the upcoming friendly game against Dutch team Ajax, the “Babe of the Brasileirão” competition and much, much more. Stay tuned!